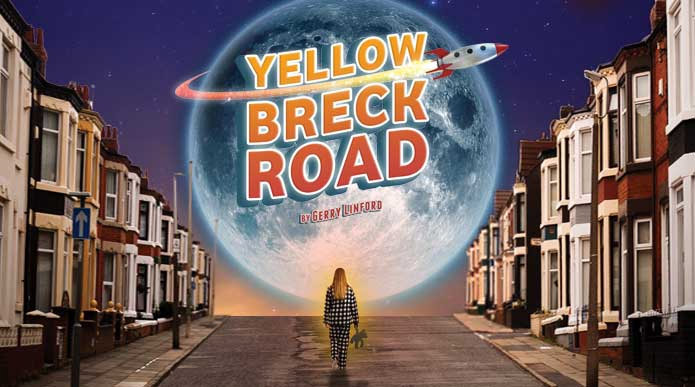 The Royal Court’s latest offering, Yellow Breck Road, is written by Gerry Lindford and directed by Bob Eaton. With those two at the helm it has all the usual indicators to make this another Royal Court hit, but sadly it fell short of the mark. The story introduces us to the Potter family who are about to lose their home. Gemma Brodrick plays Dot, a young girl who has anxiety and an unhealthy addiction to her mobile phone. She is responsible for looking after her Nan, Nora, played by Eithne Browne, who is in casts after a fall and suffers from severe bowel issues. 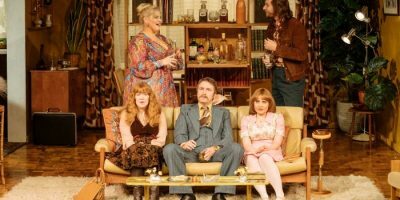 Dot’s parents, Billy and Carol, are played by Paul Duckworth and Lynn Francis, with Uncle Barry being played by Jake Abraham and the local ‘baddie’ Harry being played by Jamie Greer. Special mention must be made to Set Designer Olivia du Monceau, for managing to create a pathway from a terraced house to the surface of the moon, whilst always having the galaxy in the background. Another triumph for the Set Builders at the Royal Court. The story unfolds as the family are about to lose their home, Dot is electrocuted which sends her into a coma. In her coma she dreams up a trip to the moon, complete with her lovable Uncle Barry, who guides her through her entire family history, thereby explaining their current situation. Whilst there are a couple of truly wonderful moments, specifically when Francis and Duckworth are shown as children playing, which echoed moments in Blood Brothers. Also, when Dot asks why she is in hospital on the moon, Abraham’s gag about The Royal not being finished yet drew huge laughs and rounds of applause. Yet despite these brief moments of amusement, this vied far too much into The Royal Family territory. The ongoing jokes about Nora’s bowels felt aged and laboured. The talented Browne is wasted in this role. The whole concept fell flat with poor execution. Most of the Royal Court’s show ventured into the silly sometimes, but this show took up residence in silly and stayed there. The Wizard of Oz concept was useless, as apart from Dot’s Red Glitter Dr Martens there was nothing else to link the two. Even the idea of wanting to go home didn’t really hit home as the whole show lacked sentiment. Perhaps less silliness and more sentiment could have turned this around.